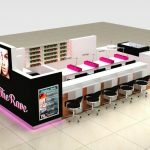 A beautiful nail bar kiosk, a fashionable nail bar kiosk, a western style nail bar kiosk. Dear friends, how is every thing going? I guess you are fine, are you looking for a nail bar kiosk? 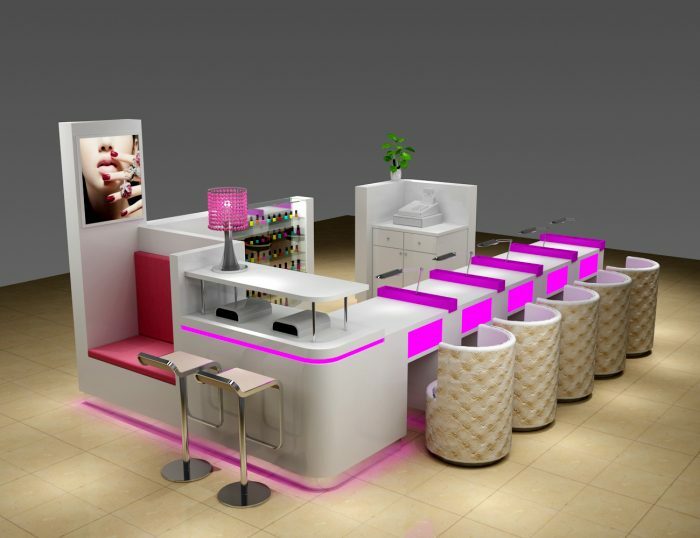 if yes, I think I can help you, because our workshop has all kinds of nail bar kiosks, today let me introduce you a fashionable and luxury nail bar kiosk.I hope you will like it. 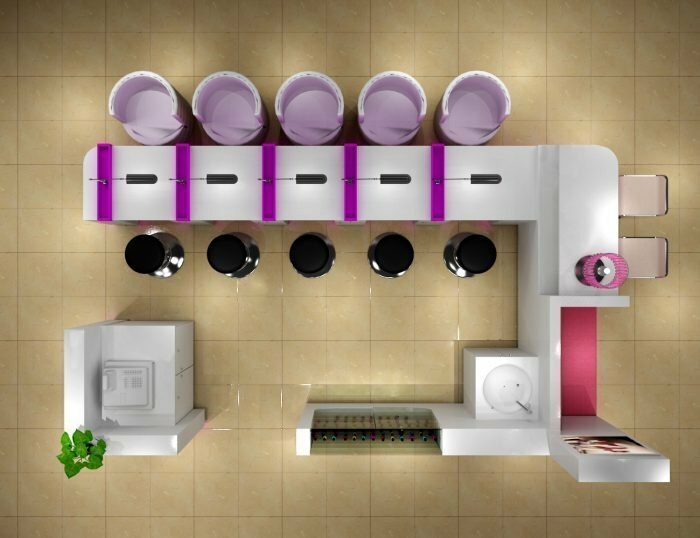 Some detailed descriptions of our nail bar kiosk. Size: 5m by 3m and we can custom-made it according to your need. Usage: Shopping Mall, custom shop. Then let us see its fashionable images. we can see, the nail bar kiosk has a rest area, very perfect, and the nail bar kiosk has two places for nail polish, very sweet. the nail bar kiosk has a transparent booth, you can put all kinds of nail polish there. the nail bar kiosk has five seats for manicure, very convinent and good. 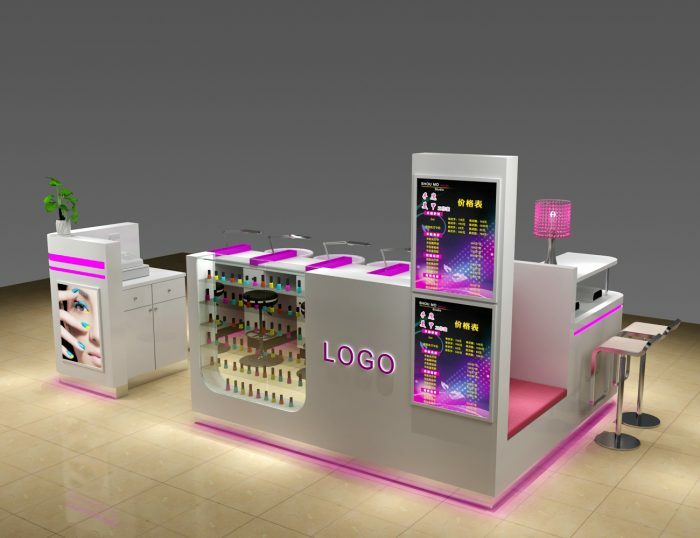 In addition, the nail kiosk has glossy table and interior, it has exquisite workmanship, perfect layout, all right specification, besides, if you want put some logo on it, we also try our best to put them on it.what’s more, our nail bar kiosk is very popular in New York. 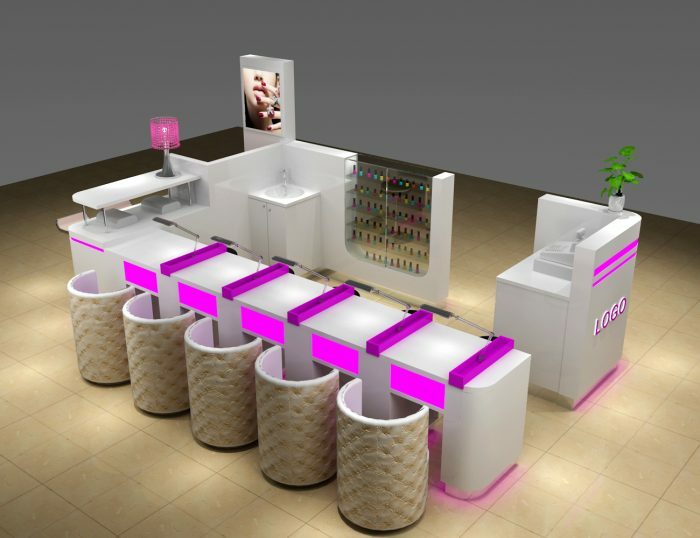 1, The design of our nail bar kiosk. you can tell us the color you like, the size you want, the style you want, then we will according to your need to design our nail kiosk, if you have any question, we will correct it until you satisfied it. I believe you will like it. 2, The price of our nail bar kisok. one, our nail bar kiosk is made by our workshop, so we will not sale too expensive, we offer the cheaper price than the trading company. two,we are professional in this field since 2006. Manufacturing in BUILK lower our material cost. comparing with the industrial company, we can provide more competitive price. 3,The steps of get our nail bar kiosk. step one, contact us, tell us which nail bar kiosk do you want, the color do you like, the size do you want, the style do you want, then we will according to your demands to make our nail bar kiosk. step two, tell us whether you like the design or not, if you like, we will make it, if you have any questions, tell us, we will try our best to let you satisfied our design, then we will make it. 4, The service of our nail bar kiosk. two, if you want to buy our product, I am sure we will give you the best product. three, we will give you our hearts, never cheat you, we welcome your message at any time. four, we will give you the best service, if you have any question with our nail bar kiosk, please tell us, we will try our best to solve them. 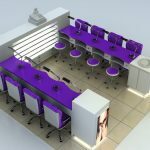 In final, thanks for your reading, if you want to learn more of our nail bar kiosk, please contact us, we are looking forward to your inquiry.